My Toilet Won't Flush, Could It Be My Septic Tank? Home / Lakewood Ranch Plumber / My Toilet Won’t Flush, Could It Be My Septic Tank? My Toilet Won’t Flush, Could It Be My Septic Tank? A lot of folks think that when their toilet doesn’t flush and they are on a septic tank, that they should have the tank pumped out and that will fix the problem. Pumping your septic tank is usually not the answer. But now you have spent the money, your problem is still there, and your upset that you have to call a plumber. Before you pump the septic tank, get a professional plumber to evaluate your particular situation. There are a number of reasons your toilet may not flush. A lot of times we find the outlet filter on the septic tank needs cleaned. This is a very inexpensive fix. Some plumbers mistake the clogged filter as a drainfield problem and want to replace your drainfield. Make sure you get an honest, professional plumber that has you best interest at heart. If you can trust your plumber in Sarasota, you will love your plumber! 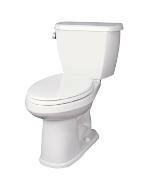 Don’t use your toilet as a trash can or poison your system with harmful chemicals. Chemicals kill bacteria that help purify the wastewater.